Hollywood is a study in contradictions. It’s a city that on the one hand celebrates its past, but then turns around and either ignores or vilifies it. Living here is a constant love it/hate it battle with one’s own feelings. I recently decided to jump into the fray, attending meetings with the Community Redevelopment Association (CRA) with regard to signage and billboards in Hollywood. The CRA really wants to do the right thing but for too long the residents of Hollywood have not spoken up about their needs, and so the business interests have held sway. Walking the streets here is an assault on ones senses—billboards and signage are starting to completely take over the Hollywood landscape, turning the city into one huge canvas for advertisers to hawk their wares. Landlords make large profits from renting the walls of their buildings to advertisers, and this has gone on unregulated for far too long. It has turned a once beautiful city into the poster child for visual blight. It’s no wonder nobody walks in LA—it’s not a pleasant experience. Although it’s not the best example of how bad things have gotten here, I thought I’d contrast an image from a postcard of Vine Street from the ’40s, with a current shot of the same street. As one can see, billboards were not an issue at the time. Signage was well designed and often dramatic–adding a colorful and graphic component, enhancing the cityscape. The same view (below) although it is a commercial street, and not as an egregious example as I could have shown, demonstrates some of the problems that we face. The worst one, I feel, is that buildings like this one are now being designed as vehicles to carry billboards. What cannot be seen in this view are the eight billboards that are on this one side of the building alone! Turn around and this humongous billboard is what’s in your face, and can be viewed for miles. Gone are the days when architecture was designed to fulfill the purposes of those who would occupy it. Now new buildings in Hollywood are thought of more for their advertising potential than their architectural significance. 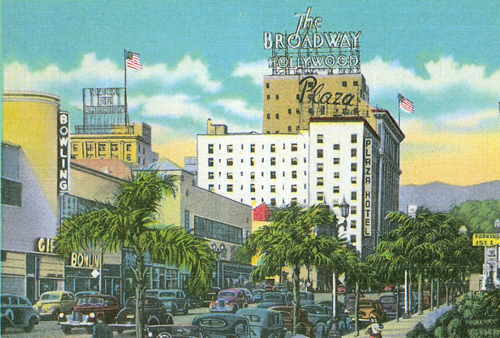 Also note the way the “Tropic Thunder” billboard obscures the historic “The Plaza” rooftop neon, and how the gargantuan billboard atop Sunset and Vine blots out the sky. Also note that the poor residents of The Plaza have their windows blotted out by a liquor ad. On a more positive note, an attempt was made to resurrect the famous “Schwab’s” logo as rooftop neon, but the business connected with it was just a flash in the pan, and disappeared a while ago. 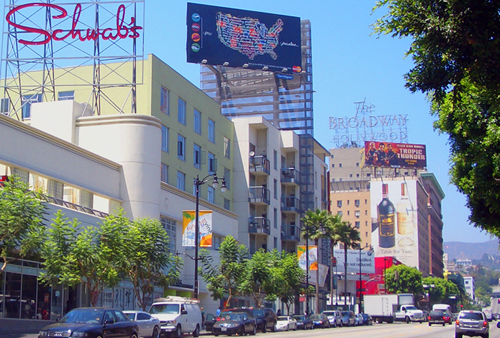 Hollywood is considered one of the worst cities in the country for billboard blight. Various groups have sprung up to try to fight it, but it seems that for every step forward we’re able to make, we go back two steps. I work with Modcom and the LA Conservancy but its an uphill battle if the neighbour-hood is not backing a proposal or just don’t care. Also there are lots of people new to this city and don’t expect to be here in however many years so don’t really care about it. What are the websites of the groups and when do they meet I would be interested in attending a meeting or trying to see how the Modcom can help. I’m sure the conservancy is aware of this too but I’ll mention it to the people I know there to check into it. I’m glad to see people with your professional expertise fighting for the beauty of our city. I only hope that a group of you can make a difference and get the CRA and others to come to our aid and eliminate this visual blight.